This handbook, produced by world renowned experts from the World Conservation Union (IUCN), spans the full terrain of protected area management and is the international benchmark for the field. The book employs dozens of detailed international cases studies, hundreds of concise topical snapshots, maps, tables, illustrations and a colour plate section, as well as evaluation tools, checklists and numerous appendices to cover all aspects of park management from biodiversity to natural heritage to financial management. The book establishes a conceptual underpinning for protected area management, presents guiding principles for the 21st century, reflects recent work on international best practice and provides an assessment of skills required by professionals. 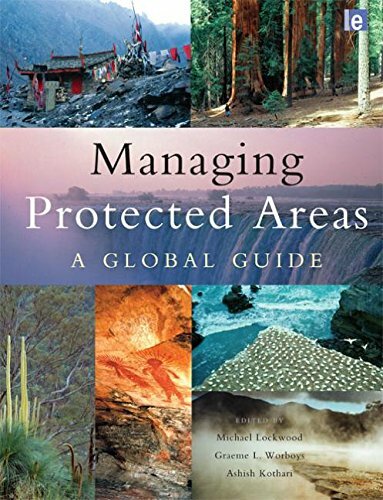 As the most authoritative guide ever compiled to the principles and practice of protected area management, this volume is essential for all professionals and students in all countries and contexts. 'The case studies offer a rich resource of cutting edge practice.' Environmental Conservation, Volume 34/4 - 2008 'Congratulations to the editors of this monumental publication! It brings together the mass of material that was brought to the 2003 IUCN World Parks Congress held in Durban, South Africa, organizes it and makes it accessible to a world wide audience. It offers a succinct synthesis of the context for protected areas management, while the principles and practise are set out in detail and across a wide front that will be relevant in every country. Protected area managers and others interested in the practice of conservation will find it an invaluable resource. It will no doubt stand as the standard global reference book on the topic for many years.' Adrian Phillips, Chair of the IUCN World Commission on Protected Areas, 1994-2000 'With the potential impacts of climate change, global tourism and biodiversity loss the need for professional park management has never been greater. I commend the editors, authors and IUCN for achieving this book. There is no doubt that this book will be the guiding international text for protected area management for the future' Bruce Leaver, First Assistant Secretary, Parks Australia and Former Director, South Australian National Parks and Wildlife Service 'The torch has been passed to a new team of park planners and managers who offer fresh approaches drawn from recent decades of experience...on how protected areas can serve humanity while conserving nature in a rapidly changing world through the application of modern science, international cooperation and community engagement.' Dr Kenton Miller, former Chair, IUCN World Commission on Protected Areas, and Vice President emeritus, World Resources Institute. 'A first-ever synthesis that brings together state-of-the art thinking from around the world on the complex business of managing protected areas' Future Survey 'It could well remain somewhere near the corner of the desk for academic and practising environmentalists and policy makers.' Malcolm Newson 2007, Department of Geography, Newcastly University. Journal of Environmental Planning and Management. 'This richly illustrated, principled but pragmatic, book is a very welcome contribution to that next stage.' Malcolm Newson 2007, Department of Geography, Newcastly University. Journal of Environmental Planning and Management. 'Managing Protected Areas provides a balance view across continents, nations and environments and brings together state-of-the-art thinking from around the world on the complex business of managing protected areas.' '[Managing Protected Areas] can be considered as an important reference, and a source book of ideas, models, case studies and approaches from around the world.' Vladica Stjepanovi-Siveev, International Journal of Environment and Pollution 'Ce livre est riche d'informations, riche de stimulations la rflexion, fondamentalement srieux, nous l'avons dit, mais agrable la lecture. Il mrite de trouver place dans la bibliothque du curieux mais aussie du responsable politiqu ou ducatif et ferait un remarquable object d'tudes dans un programme d'enseignement.' Revue des Questions Scientifiques.